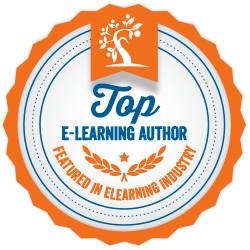 Elearning stock graphics, why subscribe? It’s important to get your graphics right in elearning so they add value to learning. I often use photos to convey realistic conversations and evoke emotion. If you are doing several elearning projects it is worth subscribing to a site that specialises in elearning stock graphics. Here are a few reasons why investing in elearning stock graphics are worth it and make developing elearning easier. People graphics come already cut out so there is no need for you to clear cut them in Photoshop or other image editing tools. This could save you as much as 10 minutes per graphic. My last project used about 20 different people images, using elearning stock gave me a saving of approximately 200 minutes of photo editing time. You’ll have a huge reduction of search time looking for the right characters that also have multiple poses and expressions. Elearning stock characters already come with a large variety of poses and expressions, you no longer need to accept that cheesy grin pose. Subscribing to an elearning stock site will give you a wide choice of characters with different ages, ethnic backgrounds and dress (casual, business, industrial, medical). You can pick people images that will relate to your audience without having to extensively search for the right images on a standard stock site. As already mentioned elearning stock people come with a range of expressions and poses. Using expressions makes it much easier to get emotion and reality into your elearning stories and scenarios. 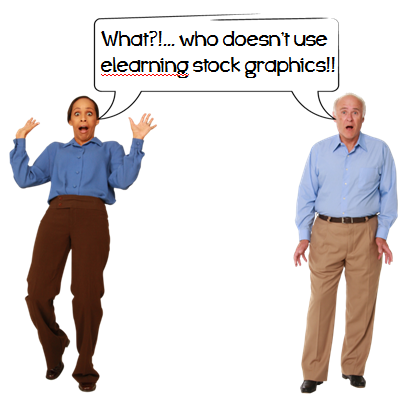 Some elearning stock graphic sites have conversation templates that you can download. The advantage of the conversation templates is that you can borrow ideas for how to build a realistic looking conversation by using different character angles and background images. Subscribing to an elearning stock graphic site often gives you access to lots other useful stuff. 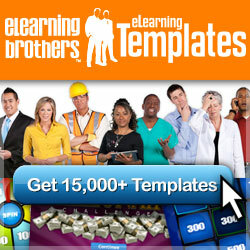 Two of my favourite elearning stock sites are Elearningbrothers and Elearningart. Both of these sites have a huge variety of cutout people, background images, speech bubbles and downloadable elearning templates. As well as the above Elearning Art has some cool isometric characters, hand written fonts and office objects. Whereas Elearning Brothers has downloadable game and activity templates, elearning sounds (e.g. correct and incorrect feedback sounds), and character videos. Using elearning stock graphics won’t eliminate the need for the occasional standard stock image but it will reduce time and energy spent on getting the right characters and emotion into your elearning. If you found this post useful click follow to subscribe to future posts and/or leave a comment letting me know your thoughts.